The DFG Senate Commission on Food Safety organizes scientific meetings on current aspects of major importance to the safety of food, with the aim of reviewing and assessing the state of knowledge in a specific field. 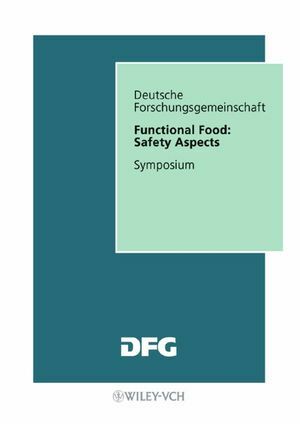 This book summarizes the important results from the meeting on "Functional Food: Safety Aspects", held at the Federal Research Center for Nutrition (Bundesforschungsanstalt für Ernährung, BFE) in Karlsruhe, attended by an outstanding faculty of internationally renowned experts from academia, industry and administration. MAIN CONCLUSIONS AND RECOMMENDATIONS CRITERIA FOR THE SCIENTIFIC EVALUATION OF FUNCTIONAL FOODS CONTRIBUTIONS. Diet, Genes and Cancer Risk (Ulrich,C. - Seattle, USA). Regulatory Framework for Functionality and Safety: European View (Viell, B. - Berlin, D). Regulatory Framework for Functionality and Safety: Japanese View (Watanabe, S - Tokyo, Japan). Aspect on the Chinese Funktional Food and their Safety (Wie, Y. - Yangling Shaanxi, China). Regulatory Framework for Functionality and Safety:North American View (Schneemann, B. - Davis, USA). Dose-response relationships with special reference to antioxidants (Bast, A. -Maastrich, NL). Low Dose Competition of Flavonoids with Endogenous Thyroid Transport Proteins: Potential Relevance to the Thyroid Hormone Axis (Köhrle, J. Würzburg, D). Host factors relevant for bioavailability: Transporters, metabolizing enzymes and genetic polymorphisms (Schrenk, D. - Kaiserslautern, D). Food matrix and related factors affecting bioavailability (Van het Hof, K. - Vlaardingen, NL). Toxikokinetics/Toxikodynamics (Walker, R. - Guildford, UK). Biomarkers to assess safety aspects and functional effects of food (Pool-Zobel, B. - Jena, D). Biomarkers Relevant to Cardiovascular Disease (Olthof, M. - Wageninge, NL). Biomarkers for effects on the immune system (Pieters, R. - Utrecht, NL). Mechanistic Understanding of Potential Adverse Effects of Beta-Carotene Supplementation (Wang, X.-D. - Boston USA). Potentially adverse mechanisms of antioxidants during cancer therapy (Biesalskie,H.K. - Hohenheim D). Cholesterol Lowering Vegetable Oil Spreads: Results of a Post Launch Monitoring Programm (Lea, L. - Bedfordshire, UK). Effect of Flavonoids on Human Topoisomerases (Marko, D. - Kaiserslautern, D). Risk/Benefit Aspects of Phytoestrogen Consumption (Boyle, C. - London, UK). Influence of Phytoestrogens on the Biotransformation of Endogenous Estrogens (Metzler, M. - Karlsruhe, D). How selective are prebiotics? (Hammes, W. Hohenheim; D). Pathogen or Probiotic- Where is the boundary? (Saarela, M. - Espoo, Finnland).